PASADENA, Calif. (AP) — Thirty-five years after leaving Earth, Voyager 1 is reaching for the stars. "We're anxious to get outside and find what's out there," he said. When NASA's Voyager 1 and Voyager 2 first rocketed out of Earth's grip in 1977, no one knew how long they would live. Now, they are the longest-operating spacecraft in history and the most distant, at billions of miles from Earth but in different directions. Wednesday marks the 35th anniversary of Voyager 1's launch to Jupiter and Saturn. It is now flitting around the fringes of the solar system, which is enveloped in a giant plasma bubble. This hot and turbulent area is created by a stream of charged particles from the sun. Outside the bubble is a new frontier in the Milky Way — the space between stars. Once it plows through, scientists expect a calmer environment by comparison. When that would happen is anyone's guess. Voyager 1 is in uncharted celestial territory. One thing is clear: The boundary that separates the solar system and interstellar space is near, but it could take days, months or years to cross that milestone. They're still ticking despite being relics of the early Space Age. Each only has 68 kilobytes of computer memory. To put that in perspective, the smallest iPod — an 8-gigabyte iPod Nano — is 100,000 times more powerful. Each also has an eight-track tape recorder. Today's spacecraft use digital memory. The Voyagers' original goal was to tour Jupiter and Saturn, and they sent back postcards of Jupiter's big red spot and Saturn's glittery rings. They also beamed home a torrent of discoveries: erupting volcanoes on the Jupiter moon Io; hints of an ocean below the icy surface of Europa, another Jupiter moon; signs of methane rain on the Saturn moon Titan. "Time after time, Voyager revealed unexpected — kind of counterintuitive — results, which means we have a lot to learn," said Stone, Voyager's chief scientist and a professor of physics at the California Institute of Technology. 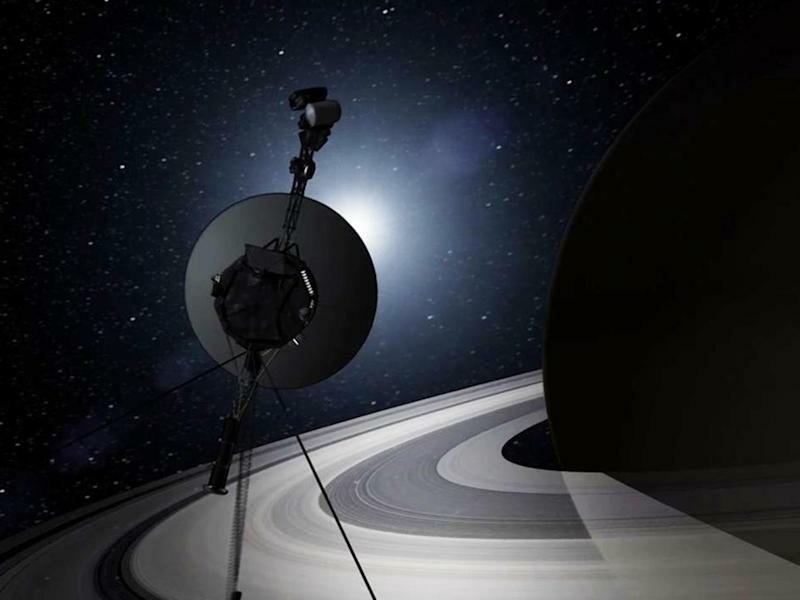 Cameras aboard the Voyagers were turned off long ago. The nuclear-powered spacecraft, about the size of a subcompact car, still have five instruments to study magnetic fields, cosmic rays and charged particles from the sun known as solar wind. They also carry gold-plated discs containing multilingual greetings, music and pictures — in the off chance that intelligent species come across them. Since 2004, Voyager 1 has been exploring a region in the bubble at the solar system's edge where the solar wind dramatically slows and heats up. 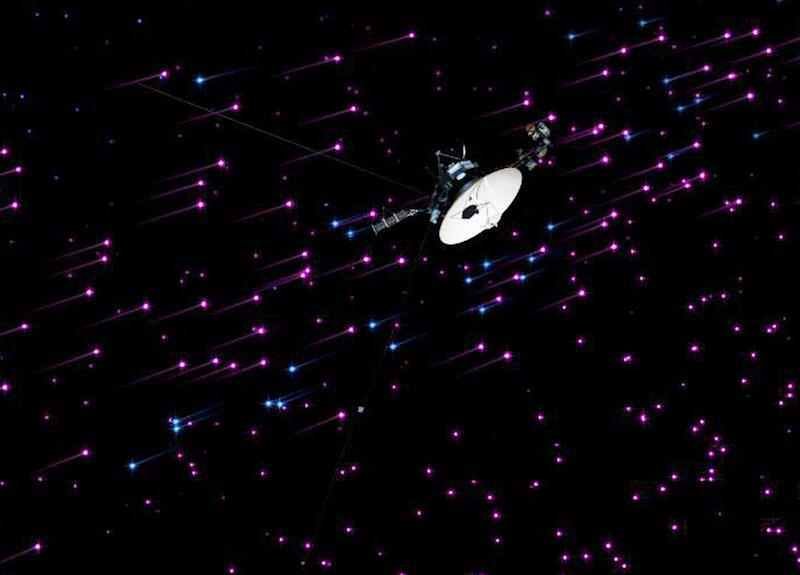 Over the last several months, scientists have seen changes that suggest Voyager 1 is on the verge of crossing over.